As discussed in the November Agronomy Update, zinc plays a crucial role in crop production. The role of zinc includes, but is not limited to: protein synthesis, seed and grain formation, growth regulation, and cell elongation. Zinc is immobile in the soil, so a constant supply is needed for optimum growth. The absence of zinc has proven to have detrimental effects on overall yield. Supplementing zinc in fertilizer applications is necessary because many Midwestern soils are deficient. Zinc deficiencies usually occur in heavily-cropped fields, sandy soils, soils that have low organic matter with high and low pH levels, newly-terraced fields, or cold and wet soils. Soils with zinc deficiencies cause stunted plant growth and ultimately a decrease in yield. According to a recent study by A&L Great Lakes Labs, nearly two-thirds of soils tested in Illinois in 2017 were below the sufficiency range for zinc. HOW MUCH OF AN IMPACT CAN ZINC HAVE? Zinc products from The Andersons are backed by research to ensure top quality and performance. 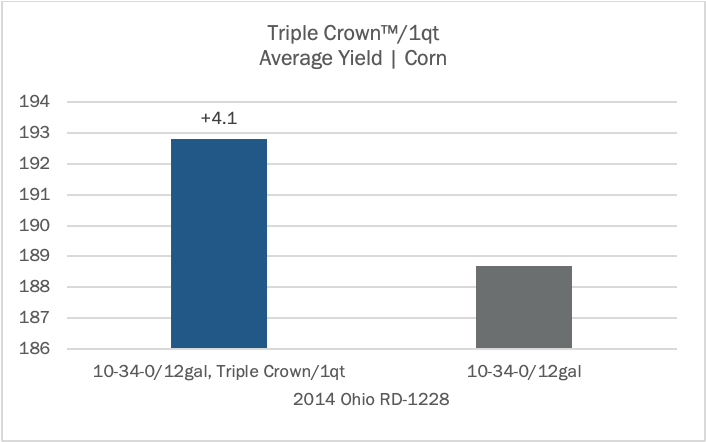 In the research below, Triple Crown™ was applied at 1 quart per acre with 10-34-0. A yield advantage of 4.1 bushels per acre was observed over 10-34-0 alone. 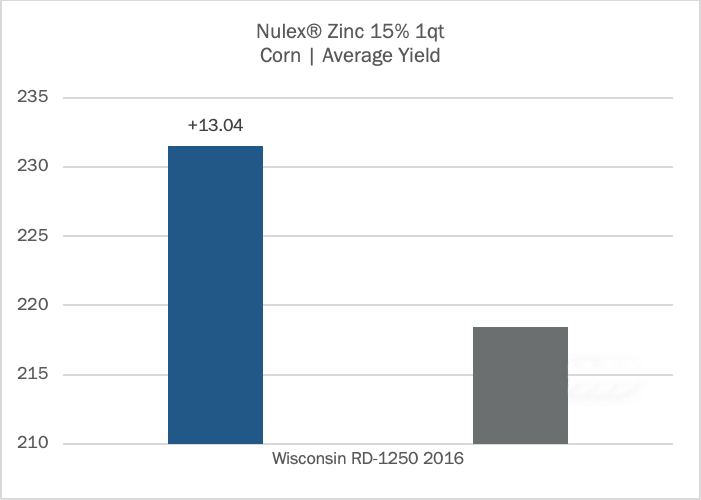 In the following Wisconsin study, Nulex® Zinc 15% was applied at a rate of 1 quart per acre with 19-17-0 at a rate of 12 gallons per acre. In this study, the portion treated with Nulex Zinc 15% had a yield advantage of 13.04 bushels per acre compared to the untreated check. The Andersons offers a full line of zinc products, with one to fit the needs of every grower. As mentioned above, our products are backed by extensive research to ensure a top performing product of the utmost quality. To avoid the detrimental yield losses caused by zinc deficiency, apply one of the following products according to label instructions. From planting and soil application to foliar, EDTA Chelated Zinc 9% is perfect for any application method. It is our only zinc that is safe for in-furrow use. It is a fully-chelated solution containing essential nutrients for quick emergence and rapid zinc deficiency correction. Zinc 9% is designed for use in all liquid fertilizers and suspensions. Triple Crown contains 3 different sources of zinc – EDTA, sulfate, and ammonium chloride. This combination provides immediate availability and sustained release. Triple Crown has excellent storage characteristics and can be mixed and stored overwinter. It is compatible with APP, UAN, ATS, and starter solutions, up to 50% polyphosphate. Nulex 15% can be ten times more effective than dry broadcast zinc. Nulex 15% can be applied at planting as a sidedress, or broadcast, and is a source of both nitrogen and zinc. It blends easily with APP, UAN, ATS, and starter solutions, up to 30-35% polyphosphate. Nulex 15% is non-corrosive, stores at low temperatures, and offers easy handling characteristics. Zinc 10% is a citric chelated micronutrient formulation best used as a splash-and-go foliar or spray application. It may be used as an additive for liquid fertilizer and is compatible with most herbicides, insecticides, and agricultural chemicals. View the Zinc Solutions Sheet to compare these products side-by-side and help decide which zinc is right for you and your operation. Questions on these products? Contact us by completing the form below. For more information, contact your dealer, call us at 800-831-4815, or complete the form below. Nulex is a registered trademark of The Andersons, Inc; Triple Crown is a registered trademark of The Andersons, Inc.